PA State Rep. Jack Rader - How Would the State Budget Proposal Affect YOU? How Would the State Budget Proposal Affect YOU? Gov. Tom Wolf on Tuesday delivered his annual budget address to a joint session of the state House and Senate. The governor called for approximately $1 billion in additional spending, but did not call for any broad-based tax hikes. I was disappointed the governor’s budget proposal did nothing to address the looming property tax issue in Pennsylvania. I’m pleased the governor is not asking for any new or increased broad-based taxes. I think there are areas where we’ll be able to find some common ground on issues like fighting the opioid epidemic and investing in workforce training. The governor’s overall spending proposal is a bit aggressive, so we will look for ways to identify savings to drive down the cost for taxpayers. 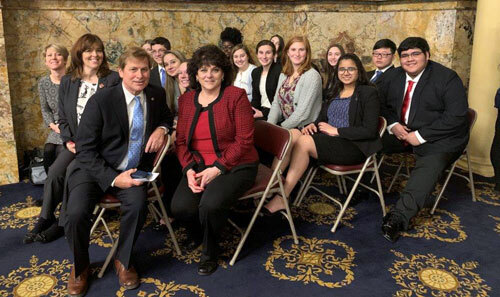 Members of the Pleasant Valley High School Future Business Leaders of America (FBLA) joined me this week in the state House in Harrisburg as we approved a resolution marking this "FBLA Week" in Pennsylvania. Copies of the trout stocking schedules, including a searchable database, can be found online at PFBC website or the PFBC’s “FishBoatPA” mobile app.